Will you stage a demonstration against the Great Leader or seek to counter this subversion? Go to www.youhavefoundconey.net/counterdemo.html in advance to discover which side you are on, and download an mp3 to make you a player. Both sides mingle in the crowds and press play on the clock. Discreet actions and challenges unfold, guided by the voice whispering in your ear. Who is on your side? Will the demonstration be made or will it be countered? A game of counter-demonstration made by Coney, an agency of adventure and play, in the same vein as last year's Earpiece. Tassos Stevens is a runner in Coney. He's a game-designer, theatre-maker and has a doctorate in Psychology (www.allplayall.blogspot.com). Tom Haines is a dab hand on a cocktail drum for the London Snorkelling Team, a qualified marine navigator, and half of Brains and Hunch (www.tomhaines.co.uk). Neil Bennun is an author and performer. He's based in Copenhagen. (www.neilbennun.com). 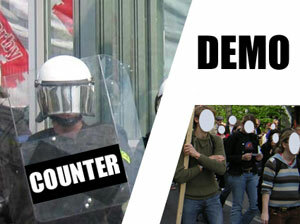 Counter/Demo was devised and designed in Coney's online Garden. Coney (www.youhavefoundconey.net) is an agency of adventure and play. Coney designed People-Watching for COaP Amsterdam 07, Earpiece and The Following for COAP 2009. Recent projects include A Small Town Anywhere (www.youhavefoundconey.net/vaults/aboutsmalltown) in a co-production with BAC, A Cat Escapes in primary schools in Wandsworth in a co-production with BAC, Papa Sangre (www.papasangre.com) in collaboration with Somethin' Else commissioned by 4IP, and upcoming projects including commissions for the Tate and New Art Gallery Walsall.